Motorists’ patience will be tested to the limit on Wednesday as the revamping of a major Wigan junction reached its trickiest phase. Long snarl-ups were expected as even tighter road restrictions were temporarily introduced at the Saddle. 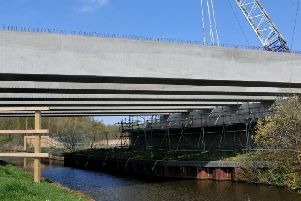 Wigan Council is delivering the Cycle City scheme on behalf of Transport for Greater Manchester and as the works pass the halfway mark, residents are being thanked for their continued co-operation. Becca Heron, director for economy, said: “Works are progressing well along Saddle Junction and Wallgate and since the Robin Park Road section of the scheme was complete, we’ve received good feedback. “We are working extremely closely with the contractor to ensure any disruption is kept to a minimum or during off-peak hours. This week will see the continuation of the three inbound lanes from Warrington Road being reduced to two. But crucially - and disruptively - for the next two weeks, the left turn from Pemberton towards Robin Park Road will be closed while it is reconstructed into a cycle lane and a new left turn is created between two new islands. While this work takes place, motorists will have to go around the Saddle Junction to access Robin Park Road. Signed diversions will be on site. There will also be a lane closure on Warrington Road outside the Queen’s Arms pub during off-peak hours this week. Ms Heron added: “Saddle Junction is one of the borough’s busiest junctions, so we fully appreciate that this may be inconvenient for some motorists, however, lane closures and reductions are only done when absolutely necessary and is the only way that the works can be continued safely and timely. “Once complete, the cycleways will reduce congestion and air quality will be improved, which is a key priority for us. “We’re committed to improving transport for commuters of all kind and offering suitable cycle facilities and lanes will give people more confidence to get on their bikes. The completion of the Cycle City programme in Wigan - paid for by the Department for Transport - is expected to be completed by the year’s end.